Smartphones are used today even by our children and countless applications serve the users for better life, work and free time. I use my mobile for e-mail, but also for maps, navigation, parking, and of course entertainment. It is difficult to understand that public servants would have worse or in some cases none of these capabilities. Despite the almost endless debates about public safety network infrastructure demands, it is clear that a well- functioning broadband access would be an important addition to their work. In this blog I’m highlighting the issues on why public safety broadband is important, how it could be implemented and what are the alternative solutions to use. It would be really important to help public servants to use modern applications. There are vast amount of data available in open or protected data bases that could provide for excellent help. Also very simple modern applications like efficient office programs would be very useful whenever the officers are mobile. Also the modern command and control applications would benefit greatly from broadband. The larger data capacities would allow for up to date maps, more interactive and quicker updating situational pictures and better and broader sharing of data between the mobile units. Since we are talking also about saving lives, it is important to note that the availability of the online information is of uttermost importance. If one tries to fetch information from criminal records, latest building drawings in case of fire, or send cardio information to a doctor in hospital, the connectivity is crucial. It might not be a matter of a second or two, but one certainly cannot wait minutes for the data to be delivered. When we talk about criticality, the command and control application become a focal point. With an efficient C&C application one can share information about other units’ location, target drawings and other various case specific information. More instantaneous the data is, better security it provides for the officers on the case. We have seen live situational picture shared from the criminal site to enhance co-operation and to minimize the inefficient use of mobile voice terminals. But can you rely that the pictures and other important data get transmitted? The most common mistake public safety has made is to rely solemnly on one commercial broadband network. It almost seems like all concentration with the development is on the applications. Too often the connectivity issues is handles by a short notions “… oh and we’ll use the broadband of the number one commercial operator, with a dongle or similar.” One network is never enough, no matter if it is a commercial or even a dedicated network. It is not within any foreseen organization’s or nations capabilities to build redundancy and availability required just for one network. All networks have occasional service break downs, larger or smaller scale. Network have internal IP addressing changes also that break the links and require for a new connection set-up. A very normal availability over any larger single network when in full operation is about 96-98%. The obvious and most used solution to the broadband question in the market is to repeat the previous implementations in a new environment. The communication of public safety has been previously done by dedicated networks. It all started with RF – radios and with digitization the P25, Tetra and Tertrapol technologies have been implemented. These regional or even countrywide implementations have been paid with the taxpayers’ money and the argumentation for the need has been along the lines like “this is the only solution you can trust your life on”. Well, no solution is 100% sure and despite not much communicated, we know that the existing digital PMR networks are far from being perfect. A good questions today is if really a dedicated network is even needed for the voice services? There are novel push to talk possibilities, various MVNO approaches and such that could even replace the existing networks. If we select a dedicated networks for the public safety use, we should consider the cost vs. benefit. How about the broadband data then? The approximate user amount of a dedicated networks compared to a commercial one is about 0,5%. The dedicated networks builders argue their point that this small amount of users isn’t interesting enough for the commercial operators. So is the answer to build an own networks with even higher availability requirements on top of that? With a simple calculation the cost would be 200 fold! How much are we really prepared to pay for this services? There is always a limit to everything and I have hard time to believe that dedicated network especially in Broadband would as a single solution fly anywhere. I understand the need for something special in cases of network congestion during certain areas in crisis or coverage for remote areas where there is no business case for the connectivity for commercial networks. But elsewhere the commercial solution is very interesting. Everything previously discussed summarizes that utilizing hybrid dedicated and commercial networks or a combination of commercial networks brings the availability to the accepted level for Public Safety vehicle use. It is then always a matter of resilience on what the approach selected in each region or country would be. What we have experienced is that with constant monitoring capabilities and Mobile IP enhanced session persistence, the multiple networks approach combined with selecting always the best one even exceeds the current needs. The key elements include that multichannel routing solution needs to have short switch over time between networks and that the sessions need to stay up when the IP addressing changes. The solution needs to be network agnostic, so that the applications don’t have to know anything about network changes! Goodmill has most likely the largest installed base of managed multichannel routers in the public safety in the world. The solution has been used in nationwide implementations for years with MBTF of more than 400 000 hours for the routers in use. The remote management (over-the air) OTA management capabilities provide for constant online view of the whole fleet connectivity and provides access to routers whenever needed. All software features can be remotely updated quickly and without any specific routing knowledge. The product family consists of multiple routers from desktop applications to highly rugged versions with EN50155 vibration tolerance and IP65 environmental protection. The much specified customer base includes highly skilled and most advanced public safety operators in the world. Company will grow and develop the products to meet the highest standards also in the future. I have met many partners and customers who have stated that multiple network approach is an expensive solution, not only due to hardware and software pricing, but also due to high network data costs. Let’s look at this with a bit more detail. First of all one should look at the costs of the whole unit on the wheels. No matter if it’s ambulance or police car, one can easily calculate the costs of two persons in the vehicle and the vehicle costs jointly adding easily up to €100 to €200 per hour. The issue with the broadband connectivity is efficiency. Can we use this expense more efficiently if we have a reliable broadband to the vehicle? Well, for sure we can! The availability increase by using 2-4 WAN links instead of one is very dependent on area and country. However, in almost all cases only the availability increase and the efficiency it brings, gives paybacks according to our calculations of less than 6 months. As short as seven weeks paybacks have been reported, and this includes all the extra network and equipment costs! The normal availability increase is about 3-4 percent, but also even 18-19 percent increases over single network have been registered! 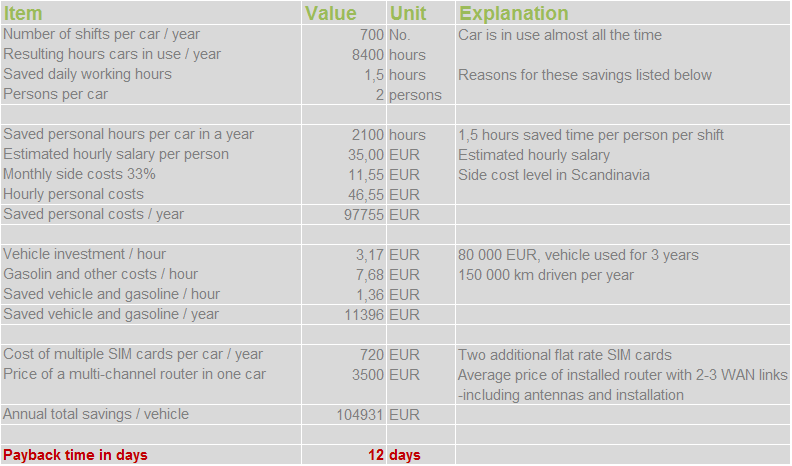 It the table we have concluded some data from a police vehicle used in Scandinavia. The clue is, whether the users actually start to do their work on the run. If the connectivity is not good enough, no matter how cheap, the applications will not be used! As an example the Goodmill’s router solution brings almost always the availability to a commonly accepted “office level” availability and thus enables the full use of the efficiency enhancing apps! The availability levels need to be always more than 99% and in many cases up to 99,9% is required. Only this availability doesn't affect negatively the office application usage and the “office on the wheels” gives huge advantage with hours of effective working time savings each shift! The savings are achieved because the reliability of connectivity is so high that the office work can be done in the field. Everything is done only once, directly in the database. For instance parking tickets and other forms can be electronically filled already in the car, so no paper to computer tasks are required. Additionally customer's identity can be checked by using online photos and videos and unnecessary trips to precinct can be avoided. Additional advantages include improved safety for officers and customers and obviously much improved situational awareness all in all! It is thus proven that the high data rate and high availability broadband services give a tremendous advantage to police and public safety operations on the field. This is direct response from users that have used the technology even for years now. The applications demand all the time more bandwidth, also the current ones in use. In the future online streaming video will be the killer application. Additionally all the intelligence cannot remain in the vehicle computer. This means that safe and high availability access to central databases is a must. A managed multichannel routing solution is the future proof answer to the needs and no huge upfront investments are needed: one can start easily with multiple commercial operators. The links can be easily upgraded to new dedicated networks when they emerge. A wonderful benefit of Goodmill is that it can use any available network technologies now and in the future, provided that there are modems available. From monetary point of view the approach is rock solid. The payback is from only some weeks to months in pure savings for the whole systems introduced! And most importantly: the solution has proven to save not only time and money, but also lives!